To nobody’s surprise, Donald Trump, the billionaire front-runner for the US Republican party’s nomination for presidential candidate, has continued to spread his views on the dangers of vaccination. Trump is no stranger to controversy, least of all when it comes to airing his much-debunked ideas that vaccines cause autism. He has long insisted that his anecdotal evidence proves that autism is rife and is being directly caused by vaccinations, specifically but not exclusively by the MMR vaccine. Trump again decided to express his opinion last night on CNN’s televised debate, which went largely unchallenged by one of his other nominee contenders, Dr. Ben Carson. They both seemed unaware that rather than there being an autism epidemic, there is a growing risk instead of a measles epidemic. A popular theme emerges when we examine this type of conspiracy theory – that of conflated political concern. We take a genuine and understandable worry about the size of government and its potential role and interference into citizens’ lives, but then we inflate this into something that becomes inaccurate in the face of science. Vaccinations are an incredibly important part of a child’s development, but does or should a parent’s right to choose what is best for their child override that? Unfortunately the nuances of that genuine debate are overshadowed by bad science and the idea that the government or ‘Big Pharma’ are somehow poisoning children for their own selfish ends. The majority of Americans believe vaccines to be safe, regardless of political belief, but the opinion is clearly split between those who feel vaccines should be mandatory and those that feel there should be some form of parental choice. Dan Jolley and Karen Douglas demonstrated in an excellent study in 2014 that exposing people to anti-vaccine conspiracy theories made them less likely to vaccinate compared to controls. Their findings helped demonstrate how conspiracy beliefs can have serious real-world consequences, and can have a role in shaping health-related behaviours. 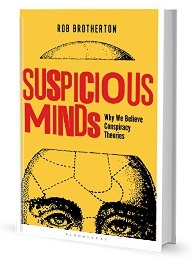 Interestingly, the effect of the conspiracy theory could be explained in part by participants’ existing perception of the dangers of vaccines, alongside their feelings of powerlessness, disillusionment and mistrust in authorities. A very recent study published earlier this year may give us some answers. Zachary Horne and colleagues from the psychology departments at the University of Illinois and University of California found that the best way to positively impact people’s attitudes to vaccination was not to try and counter existing anti-vaccination theories. Instead, they found that by highlighting factual information about the dangers of communicable diseases, such as measles, had a significant effect on attitudes surrounding vaccination. Participants were shown short passages written by a mother whose child had contract measles, alongside pictures of children with measles, mumps and rubella, stressing the importance of vaccinations. By making people understand the consequences of failing to vaccinate they found the change in attitudes to be far greater than any form of correction of the bad science about the dangers of vaccinations. Could showing images of ill children counteract anti-vaccination belief? Worldwide, there are 400 deaths a day from measles, but because the successful vaccination programmes of first world countries have more or less eradicated this terrible disease, we are in danger of forgetting just how serious it is. So, perhaps an admirable Twitter campaign could instead remind Trump and others of the dangers of not vaccinating children, rather than the debunked science behind their theory? This research opens up a promising new avenue for delivering parents accurate information but also reinforcing the importance of vaccination. This entry was posted in Social psychology, What's the harm and tagged american, conspiracy, donald, measles, republican, trump, USA, vaccine. Bookmark the permalink. What does Trumps views on vaccines have to do with the paranormal? And how does your so-called expertise in Anomalistic Psychology fit in this medical context? Do you know anything about the medical issues, or are you just out naming “fruitcakes” and “conspiracy nuts”? What do you think the exponential explosion in autism is due to? Perhaps it’s psychosomatic, aye? Once rare, autism has reached epidemic proportions in the United States. The increase cannot be attributed to changes in diagnostic criteria, which have actually become more restrictive. Already a heavy burden on educational facilities, the increasing number of patients afflicted with this serious disability will have an enormous effect on the economy as the affected children reach adulthood. Studies of all possible causes of the epidemic are urgently needed. To date, studies of a potential relationship to childhood vaccines have been limited and flawed. Earlier in the program, cases of autism in U.S. schools were few. As they steadily increased, a decision was made to list autism as a separate entity starting in 1991. As shown in Figure 1, the number of children aged 6 to 21 with autism in U.S. schools rose steadily.from 5,415 in 1991-1992 to 118,602 in the latest published.Department of Education report for the 2001-2002 school year. So far, though the CDC does not know what causes autism and its neurological, endocrine, gastrointestinal, and immune symptoms, it appears determined, without a single clinical study of its own, to deny the potential role of MMR vaccination and mercury preservatives. The possibility that mercury may affect the immune system of certain genetically predisposed children and trigger autism upon their exposure to MMR has never been conclusively ruled out. The decision to remove thimerosal from pediatric vaccines in 1999 was wise. It is difficult to believe that, to assure sterility, a known poison had been added for more than 60 years to products intended for infants. Safer “preservatives” should have been used. I wonder if you haven’t had your injections, be interesting if you have. conspiracykiller, more hooting ululations from the killer clown here again. You are a waste of precious oxygen. Of course I do not get any injections. I know better than that. How ’bout you Bozo? Interesting and timely post, though I think it’s important to highlight that Carson did come out and say pretty clearly that vaccines don’t cause autism (after waffling a bit at the start). He seemed to be referring to the HPV vaccine controversy, which is a pretty big culture war issue. I’m not sure even Trump is a vaccine/autism true believer. Mandatory vaccination is enough of a culture war issue these days that savvy politicians can play to it – worried suburban parents are going to appreciate candidates telling them that they don’t have to get their kids any scary vaccines to get them into schools. Whether the reasoning is because of autism or because of a moral panic about STIs doesn’t especially matter. Trump, as usual, takes to this like a bull in a china shop – he knows a chance for a headline when he smells one. “Mandatory vaccination” — Yes that is the issue isn’t it? The bottom line is whether the collective has the legal and moral authority to overrule the Unalienable Rights to Liberty of the individual. If your own, or your children’s bodies are now the property of the state to say what will and will not be done with them, where does that leave our cherished freedom of choice? Or are some animals at the farm more equal than others? The ‘Psychologists’ hosting this site may be familiar with the Dunning–Kruger effect; a cognitive bias wherein relatively unskilled individuals suffer from illusory superiority, mistakenly assessing their ability to be much higher than is accurate. There are variations of the D-K effect as well; such as those who have expertise or ‘skills’ in one topic, and mistakenly think that this expertise can cross over effortlessly to other areas of knowledge. Their general intelligence is of course a factor for assessing any information. But that does not mollify the situations wherein these “experts” do not actually study the details of an area of research they are not qualified in, and merely assume from ignorance that their standing as an expert in one field only reaches validity in that specialty. One of it is I think:, repetition.